Zuma (1975) was the first Neil Young album to feature the second line-up of Crazy Horse, with Frank “Poncho” Sampedro on guitar and vocals in place of Danny Whitten, who had died a few years earlier of a heroin overdose. Whitten had been a strong guitarist, with a rhythm-guitar style that still bore traces of the soul and doo-wop he had played when Crazy Horse had been Danny and the Memories. His contributions on guitar and harmony vocals were crucial to the success of Evetybody Knows this is Nowhere, the first record Young cut with Crazy Horse. While Young did include Billy Talbot and Ralph Molina on his records after Whitten died, they weren’t Crazy Horse records. Crazy Horse is a particular thing, and with Whitten gone, it didn’t exist. When Talbot met Poncho, he had a hunch that he would click with Neil, and so he hyped Neil on him, insisting that Poncho could fill Whitten’s shoes. While Young did indeed like him, he quickly realised that Poncho was inexperienced and his guitar playing was still rudimentary, so he’d need to keep things simple for Poncho’s benefit. Zuma accordingly became an album of big, simple songs with big, simple chord changes, ideal for breaking in the new guy. Fortunately simple suits Neil Young. He can take three or four chords and build a world out of them. He can make Cortez the Killer, for one thing. If you’re in any way a fan of Neil Young’s guitar playing you’ll probably know it, but if you don’t, you’re in for a treat. It may be his finest moment as an electric player: throughout the song’s seven minutes, Young’s playing is edge-of the-moment, incandescent. Behind him, Crazy Horse rise to the occasion, as they always seemed to when Young’s songs demanded it. It’s a return to the sort of hypnotic, churning groove they patented on Everybody Knows this is Nowhere. Ralph Molina in particular plays a blinder; it may be his finest moment on any of Young’s records. Cortez fades out and gives way to Through My Sails. The emotional transition is so perfect, you’d think that the two songs must have been designed to fit together this way: Cortez, the shattering end of something important; Through My Sails, the sound of someone summoning the strength to begin again. In fact, Through My Sails had been recorded at an entirely separate, earlier recording session with Crosby, Stills & Nash for an aborted second CSNY album, to be called Human Highway. Accounts differ as to what scuppered the record. Some say that Nash and Stephen Stills were still uneasy with each other having fallen out a couple of years earlier over Rita Coolidge; others put it down to the drugs (in his book, Wild Tales, Nash said they fell out over “some business, some cocaine thing”). Accounts even differ as to when Through My Sails was recorded – some sources say that it was recorded on Young’s ranch in 1973 as part of the first Human Highway session; others that it was cut during the rehearsals on Neil Young’s ranch for the 1974 CSNY reunion tour. Most agree, though, it features Young on acoustic guitar, Stills on bass and Russ Kunkel on congas, with Crosby, Stills and Nash all adding their harmonies, and for a band not always known for their restraint (Stills is an incorrigible overdubber), it’s a sparse, beautiful performance. The four may have produced more technically impressive, tighter group vocals, but they never sounded more human. This entry was posted in Music and tagged Billy Talbot, Cortez the Killer, Crazy Horse, CSN, CSNY, Danny Whitten, David Crosby, Everybody Knows this is Nowhere, Frank 'Poncho' Sampedro, Graham Nash, Human Highway, Neil Young, Ralph Molina, Rita Coolidge, Stephen Stills, Through My Sails, Wild Tales, Zuma on March 17, 2017 by rossjpalmer. I love every note that David Rawlings plays. Every clanking, honking, midrangey note. The man’s a genius. Rawlings is Gillian Welch‘s lead guitarist, harmony singer and husband. The entity that releases records under the name ‘Gillian Welch’ is actually composed of two people: Welch and Rawlings. When singing together, their voices blend seamlessly; when playing guitar, their two approaches mesh perfectly. This is the essence of being a soloist who plays with a vocalist: knowing when to play and how much to play without taking the listener’s ear away from the singer. David Rawlings walks this line brilliantly. He’s a busy player; he’s not a restrained or minimalist kind of guy. But he plays tastefully. He knows that while every Gillian Welch gig will have a few dozen idiotic guitar fanboys who just want him to play licks (these are the people who’ve sent the prices of second-hand Epiphone Olympics rocketing in the last ten years, because they can’t think of an original idea for themselves), the majority want to hear Gillian sing songs, and so he plays with that end in mind. So he knows when to play, but how about what to play? I like how little bits of jazz and rock music make their way into his work, how you can always hear in his playing that rock music is where he comes from. 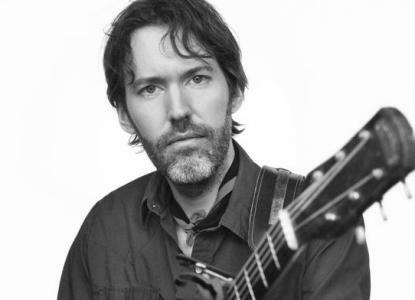 When he toured his David Rawlings Machine record a few years ago, he covered Neil Young’s Cortez the Killer. It comes as no surprise that the guy who began the third solo on Revelator by playing a repeated aggressive, obstinate Eb over an A minor chord is a Neil Young fan. The whole song, coiled and twisted with tension as it is, has been building up to this one outburst, and when Rawling hits it it’s like an explosion. Time (The Revelator) is full of little moments like this. In fact, they crop up in all Welch’s albums. But this tiny little snippet of music, just a few seconds long, is my favourite in Welch and Rawlings’ whole body of work. This entry was posted in Gear, Music and tagged archtop guitars, Cortez the Killer, David Rawlings, Epiphone Olympic, f-holes, Gibson J-50, Gillian Welch, jazz, Neil Young, Revelator, slope-shoulder dreadnought, Time (the Revelator) on December 26, 2013 by rossjpalmer.